WASHINGTON—Existing-home sales increased in October after six straight months of decreases, according to the National Association of Realtors. Three of four major U.S. regions saw gains in sales activity last month. 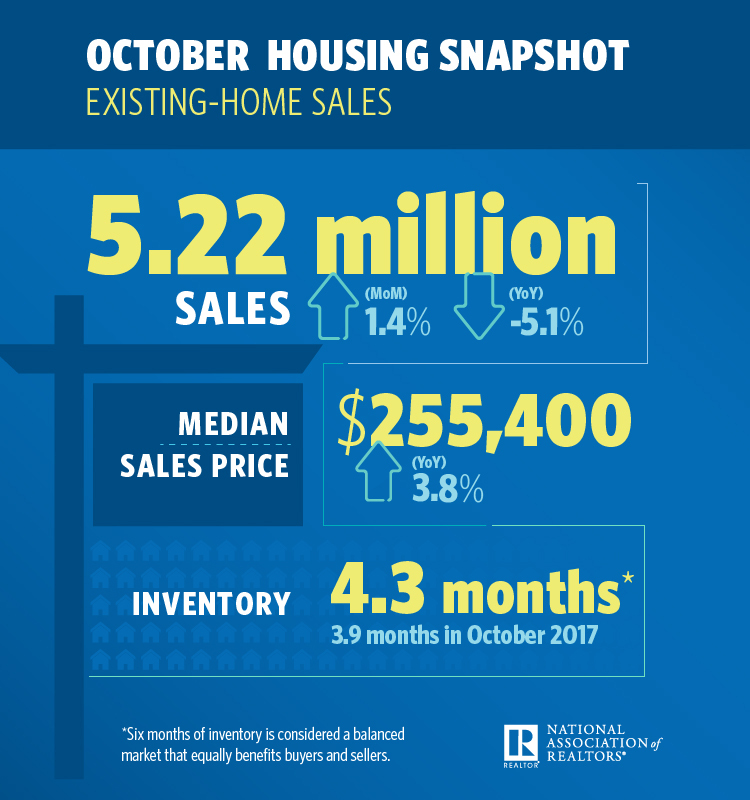 Total existing-home sales, https://www.nar.realtor/existing-home-sales, which are completed transactions that include single-family homes, townhomes, condominiums and co-ops, increased 1.4% from September to a seasonally adjusted rate of 5.22 million in October. Sales are now down 5.1% from a year ago (5.5 million in October 2017). The median existing-home price for all housing types in October was $255,400, up 3.8% from October 2017 ($246,000). October’s price increase marks the 80th straight month of year-over-year gains. Total housing inventory at the end of October decreased from 1.88 million in September to 1.85 million existing homes available for sale, but that represents an increase from 1.80 million a year ago. Unsold inventory is at a 4.3-month supply at the current sales pace, down from 4.4 last month and up from 3.9 months a year ago. Properties typically stayed on the market for 33 days in October, up from 32 days in September but down from 34 days a year ago. Forty six percent of homes sold in October were on the market for less than a month. Realtor.com’s Market Hotness Index, measuring time-on-the-market data and listings views per property, revealed that the hottest metro areas in October were Midland, TX Fort Wayne, IN. ; Odessa, TX; Boston-Cambridge-Newton, MA. ; and Columbus, OH. According to Freddie Mac, the average commitment rate for a 30-year, conventional, fixed-rate mortgage increased to 4.83% in October from 4.63% in September. The average commitment rate for all of 2017 was 3.99%. “Rising interest rates and increasing home prices continue to suppress the rate of first-time homebuyers. Home sales could further decline before stabilizing. 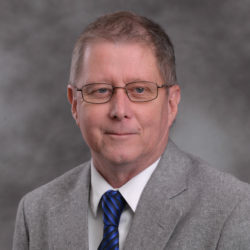 The Federal Reserve should, therefore, re-evaluate its monetary policy of tightening credit, especially in light of softening inflationary pressures, to help ease the financial burden on potential first-time buyers and assure a slump in the market causes no lasting damage to the economy,” says Yun. First-time buyers were responsible for 31% of sales in October, down from last month and a year ago (32%). NAR’s 2018 Profile of Home Buyers and Sellers—released in late 2018—revealed that the annual share of first-time buyers was 33%. All-cash sales accounted for 23% of transactions in October, up from September and a year ago (21% and 20%, respectively). Individual investors, who account for many cash sales, purchased 15% of homes in October, up from September and a year ago (both 13%). Distressed sales—foreclosures and short sales—represented 3% of sales in October (the lowest since NAR began tracking in October 2008), unchanged from last month and down from 4% a year ago. Two% of October sales were foreclosures and 1% were short sales. Single-family home sales sit at a seasonally adjusted annual rate of 4.62 million in October, up from 4.58 million in September, and are 5.3% below the 4.88 million sales pace from a year ago. The median existing single-family home price was $257,900 in October, up 4.3% from October 2017. Existing condominium and co-op sales were recorded at a seasonally adjusted annual rate of 600,000 units in October, up 5.3% from last month but down 3.2% from a year ago. The median existing condo price was $236,200 in October, which is down 0.2% from a year ago. October existing-home sales in the Northeast increased 1.5% to an annual rate of 690,000, 6.8% below a year ago. The median price in the Northeast was $280,900, which was up 3.0% from October 2017. In the Midwest, existing-home sales declined 0.8% from last month to an annual rate of 1.27 million in October, down 3.1% overall from a year ago. The median price in the Midwest was $197,000, up 2.4% from last year. Existing-home sales in the South rose 1.9% to an annual rate of 2.15 million in October, down 2.3% from last year. The median price in the South was $221,600, up 3.8% from a year ago.